five + = 8 Required Please enter the correct value. But have Fed policies helped the U.S. economy -- or have they harmed it? Keith Fitz-Gerald: "Federal Reserve Policy Is Past Its Prime, Ignores Middle Class"
Money Morning Chief Investment Strategist Keith Fitz-Gerald talked U.S. Federal Reserve policy with "Varney & Co." host Stuart Varney on FOX Business Monday morning. There is a lot of lip service being paid to the upcoming stock market crash that we're supposed to expect once the Federal Reserve starts raising rates. Every time we get close to a regularly scheduled Federal Reserve statement, financial pundits pontificate about the nuances of what the Fed Chair might say, not say, or imply. 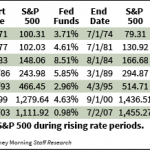 But one theme remains constant: any tightening of the Fed's easy monetary policies will spell impending doom for the easy-money-addicted stock market. 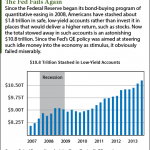 Despite billions in bond-buying "quantitative easing" and near-zero interest rates courtesy of recent Fed policy, Americans have stashed $1.8 trillion in low-yield accounts since the QE program started in 2008. It's a failed stimulative policy that has left a shocking $10.8 trillion on the sidelines. But when it comes to investing in stocks in particular, the news gets even worse. Have you noticed that the world is on a creeping - some (that would be me) would say cascading - slide into socialism? It started with one giant step in the direction of economic socialism. Economic socialism is specifically the shared risk the public has been yoked into pulling on behalf of banks. The unmistakable and indelible footprints of socialism's latest forward march have been made by collectivist central bankers, pushed forward (at least that's the direction for them) by their constituents, the bankers of the world. The bankers' jackboots are filled with stinking feet itching from the fungus of greed. And sadly, the sole of those boots bears the unmistakable "Made in America" stamp. What's flooded into all those succeeding footprints is the stagnant future we all face. The march towards global hegemony of bankers' birthrights makes that evident. It's not ironic that bankers espouse capitalist, free-market doctrines, but under cover of their ostensible handlers - their central bankers - prosper and propagate behind a Marshall Plan whose manifesto is socialized risk; it's sickening. The moral hazard of socialized risk, of economic socialism, is unfettered. The United States let the biggest banks in America get bigger. We let them bridle us, saddle us, and ride us into the ground. And they are all bigger now. How can there be any free market discipline if there is no free market? How can moral hazard be corralled if there are no fences around the risks banks are allowed to take, given their size and power? We're facing QE4ever (that's quantitative easing) on account of the banks being subject to lawsuits and an attack on their capital. Oh, you didn't get that? So far, U.S. Federal Reserve policy has done nothing to help the economy. To the contrary, it's actually been quite destructive. Yet Federal Reserve Chairman Ben S. Bernanke and his cohorts will likely expand upon their ineffective policies next week by announcing a new "Operation Twist." That begs the question: Why? If ultra-low rates and quantitative easing haven't put a dent in unemployment or spurred economic growth, then why expand on those programs? The answer: Because the Fed doesn't work for the American public - it works for Wall Street . That's right. It's not the economy the Fed has on life support - it's the banks. America's banks are facing huge litigation costs. Worse, they've grown entirely dependent on the Fed's easy-money policy. So the Fed is going to bail them out - again. And we're going to be the ones who pay for it. To really understand what's at play here, let's start by taking a closer look at the Fed's misguided policies. There are two reasons why Federal Reserve policy hasn't worked: First, the Fed's artificially low interest rates are handicapping the economy. And second, Bernanke is telegraphing Fed policy decisions to the markets, giving speculators an edge over investors. By keeping overnight lending rates between 0.00% and 0.25%, banks can borrow at next to nothing and buy risk-free U.S. T reasury securities that yield a lot more than their financing costs. The result is a "positive interest rate spread," which is the basis for banks' revenues and profits. Additionally, banks can borrow more money by using their Treasury securities as collateral for overnight and "term" loans. Then they use the cash they borrow to buy more Treasuries. They do this over and over again to leverage themselves. Essentially, banks have become giant hedge funds that finance their "trading books" with virtually free money, courtesy of the Fed's zero-interest-rate policy.